Replacement: None. 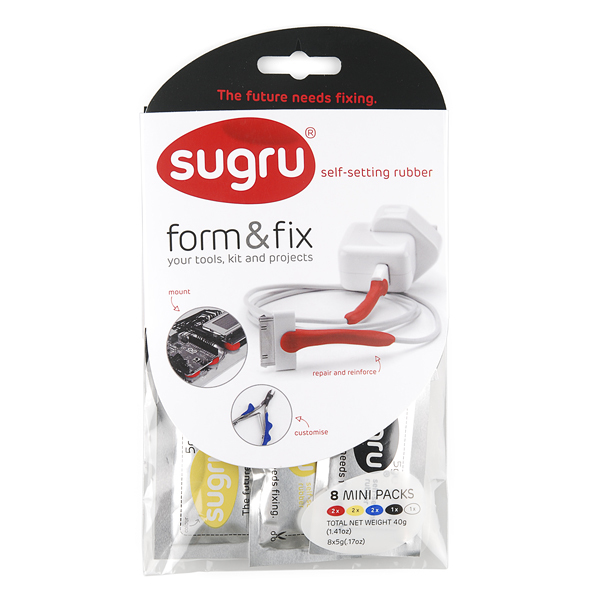 We are no longer carrying Sugru in our catalog. This page is for reference only. A 'hack' is a clever solution to an everyday problem. Sugru is a silicone rubber modeling material that sets permanently, empowering you to "hack things better." Sugru comes in sealed, 5 gram foil packets and can be worked in much the same way as modeling clay. It adheres to aluminum, steel, glass, wood, and even some fabrics and plastics. After drying for 24 hours at room temperature, it maintains a hard rubbery texture. Use Sugru to add grip to tools and everyday items, smooth over rough edges, even add non-slip padding to the bottom of electronic device/coffee mugs/anything you want! When it's dry, Sugru is waterproof and dishwasher safe, meaning you can use it on just about anything. 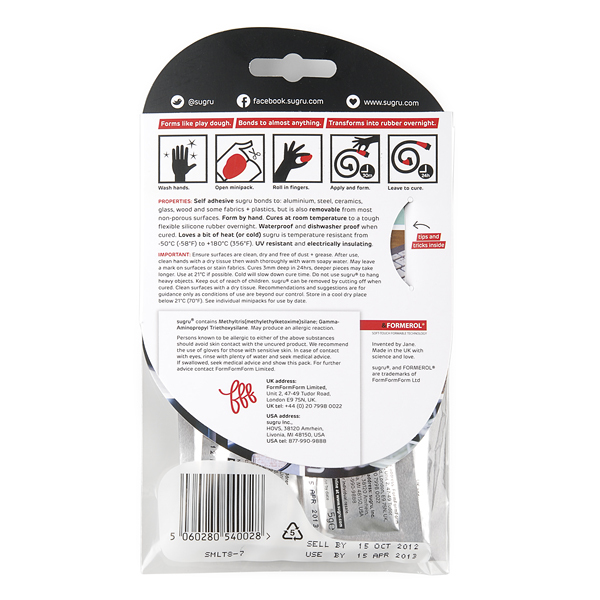 The Sugru multicolor pouch now comes with 8 mini-packs of Sugru material in 5 colors. 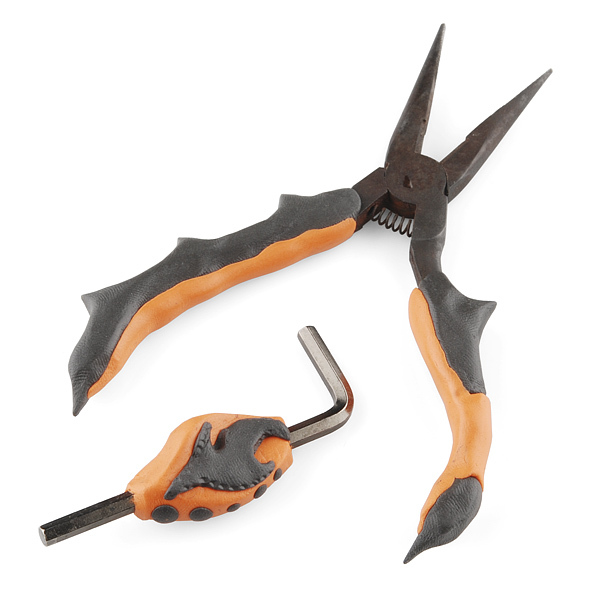 We like Sugru because it makes tools like pliers and screwdrivers more comfortable to use and also makes a great prototyping material! Check out the Sugru website below for examples of how other people are using Sugru to hack things better. 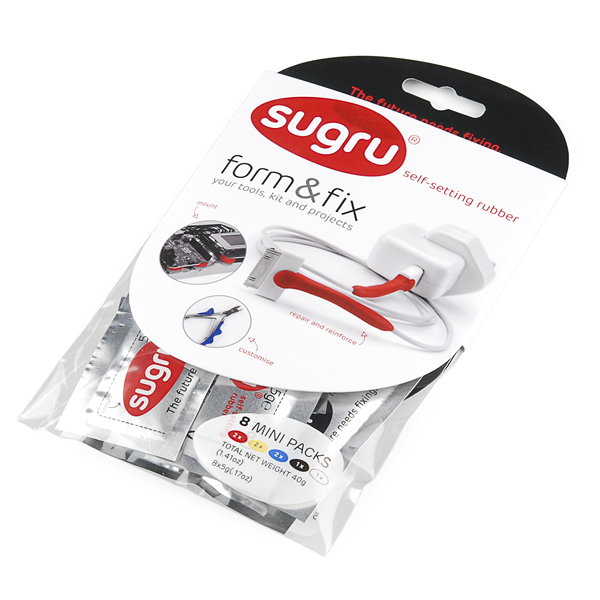 Note: Sugru will not allow us to sell this product to anyone outside of the USA. Sorry world! Sets in 30 minutes, Cures in 24 hours. Adheres to Aluminum, Steel, Glass, Wood, and even some Fabrics and Plastics. Waterproof and dishwasher safe when cured. Your YouTube video says...This video contains content from WMG. It is restricted from playback on certain sites. Just hit Watch on Youtube. It's a copyright issue. a) how hot does this stuff get as it sets/cures? b) how much does it shrink after curing? c) does it bond with skin? i'm really just concerned about what will happen if some gets on my skin and somehow dont notice. better safe than sorry. I don't have specific answers to those questions. Go here or contact sugru directly. Would this stick to the polymorph plastic I got from you guys? Would it be good to make a mold for the polymorph? There seems to be a problem with the information provided: all that we are told is what the weight of a package is but nobody that I can think of will be using it that way. Who says mentally, well, I need precisely 3.7g for this job? Nobody, that's who. The inevitable use is by volume -- you need to build up a mass of a certain size and shape and don't really care how much it weighs. So, what VOLUME of product does a package of Sugru contain? This is not an authoritative answer and certainly not in the name of either SFE or FFF (FormFormForm - yep, that's what the company behind Sugru is called.) - possibly not even in the name of me as I'm running a fever. Let's give it a whack with the information we do have, though. I couldn't find exact volume information at the Sugru website either; I'm sure if I asked them, they would tell me. But where's the fun in that? What I did find was the material properties page (you'll have to expand it at the bottom), and then the technical datasheet. The technical datasheet notes that Formerol F.10 (which is what Sugru is) has a typical density of 1380kg/mÂ³. That's great, but we want the volume/weight. Well, that's the inverse, so it's 1mÂ³/1380kg. Let's reduce that a little and just divide both sides by a thousand - that's 1dmÂ³/1380g. Still not really what we want - who measures in decimeters? (although it does conveniently translate to a liter, so if you want it in (milli)liters...). Let's divide that some more to get to 1cmÂ³. That requires another division by 1000, so 1cmÂ³/1.380g. Well hello there, now we've got something more reasonable since the packages are 5g. So how many cubic centimeters would 5g be? Well, 5g/1.380g times as much, or 3.623188cmÂ³/5g. We don't all play around with LEGOs, right? We play around with electronics! A fairly common component is a nice DIP16 package (74HC595, for example). A datasheet for one of those (packages do vary, but very little) tells me that the actual package (so I'm ignoring the leads here) is about 2.21cm x 0.625cm x 0.457cm or about 0.631231cmÂ³. So it's almost 6 of those put together, perhaps five DIP16s and a DIP12 together. If that still sounds like a small amount - it is! But then again you usually wouldn't use very much (and remember: any of it not used will essentially be waste). If you do need more (and not in multiple 5g packages), FFF does sell 20g and even 100g packages. I'll leave conversions to LEGO brick units and numbers of 74HC595s as an exercise). Can the shelf life be extended by storing in the fridge or freezer? Use it up QUICK people ! Yay, subtractive color (now you can mix them to make any color). If only it could be re-sealed. Do you know of any 2-part alternatives? This stuff doesn't harm skin (I've used it to make earplugs).